Would the Real Water Technology PLEASE Stand UP! This month frequently asked questions are focused on the use of Recovery with HydroFX® as a powder. Recovery powdered features two very important benefits. The first is the creation of alkaline water regardless of the type of water that you are using. This is a massive cost-benefit to the consumer of alkaline water because you no longer need to purchase expensive water machines and you can convert lesser expensive water to very healthy alkaline, antioxidant and molecular hydrogen rich water. Our testing used distilled water which is the most difficult water to make alkaline because the mineral content to create traditional alkalinity simply is not in the water. The miracle of Recovery in a powder form created an 8.44 alkalinity level in distilled water that would only get higher (more alkaline) with mineral water. The NORP (Negative Oxidative Reduction Potential) testing was equally dramatic. This test is a true test of antioxidant potential in Recovery with HydroFX®. 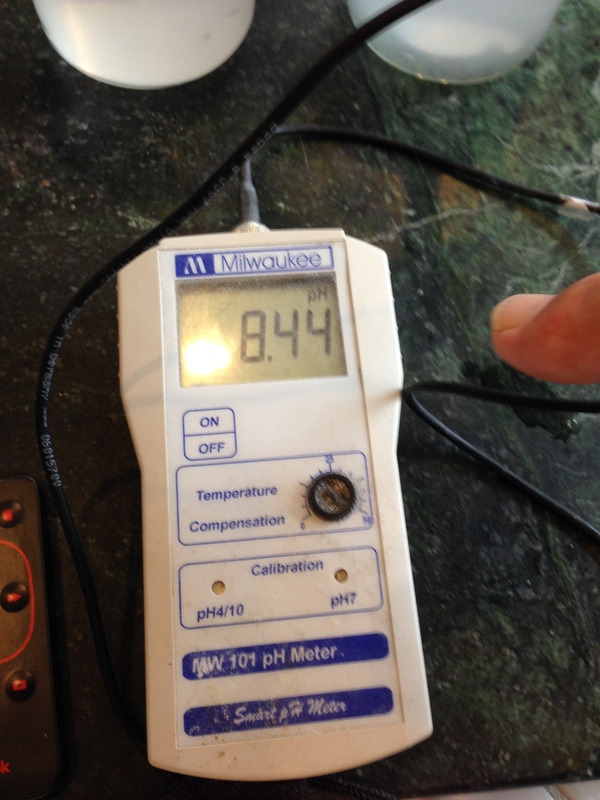 In less than 90 seconds the distilled water test created -707 and it continued to rise (more negative) to 750+. NORP values are more significant and relevant to cellular health as compared to ORAC which is more applicable to juices and plant materials but not as powerful as NORP. The rapid (90 second) creation of -707 NORP from a positive +200! The production of Molecular Hydrogen is the true test of the powerful health benefits using Recovery with HydroFX® powder. Interestingly the NORP and Alkaline pH changes in our distilled water test are actually driven by the remarkable levels of molecular hydrogen created as a result of adding Recovery Powder to the water. 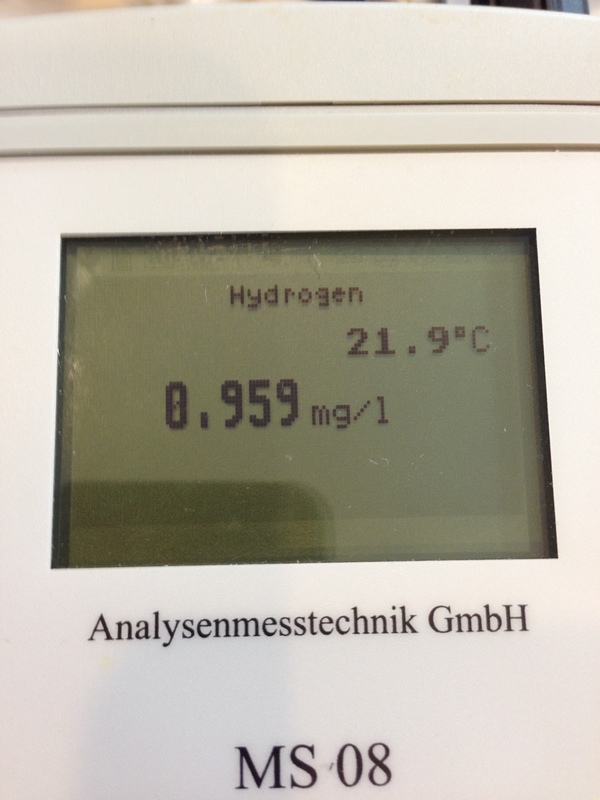 Very simply stated the maximum level of pure hydrogen via the testing device is 1.6 and you will see the meter (photo) nearing 1.0! Competing products including expensive water machines make produce a maximum of a hundred times LESS hydrogen! The second major benefit is the fact that most people are not willing to stop drinking coffee, Recovery with HydroFX® Powder will convert a very acidic cup of coffee into a remarkably healthy beverage satisfying the consumer by creating an alkaline, antioxidant and molecular hydrogen rich coffee beverage. I refer to this as “your cake and eat it too” in that you have your traditionally unhealthy acidic stimulant beverage and with a dash of Recovery powder you create a truly positive health beverage. It is important to point out that many popular coffee beverages have severe product design and ingredient defects that are harmful to human health. A popular medicinal mushroom (fungus) is recklessly added to artificially sweetened and chemically processed instant coffee that is artificially flavored and colored. Most of the readers of this information have knowledge of the harmful effects of artificial sweeteners and food additives. The lesser known dangers of Ganoderma lucidum are featured in the following paragraphs. Ganoderma lucidum, commonly known as reishi mushroom, has been used for thousands of years in traditional Chinese medicine. Ganoderma contains important constituents that may help to treat high blood pressure, diabetes, infections and hepatitis. Due to its effects in the body, ganoderma may cause dangerous effects in people with certain medical conditions and can cause negative interactions with some prescription medications. Long-term use (more than six months) of ganoderma may also cause certain side effects. Common side effects from taking ganoderma include stomach upset, nosebleeds, dry mouth and dizziness, notes the University of Michigan Health System. You may also experience dry throat, itching, nausea and vomiting, says the Memorial Sloan-Kettering Cancer Center. Additionally, you should consult your doctor before taking ganoderma if you’re pregnant or breastfeeding, the University of Michigan advises. An impressive share! I have just forwarded this onto a friend who has been conducting a little research on this.